Did anyone have a better year than Charlie Daniels? The country rock fiddler became an octogenarian in October and not many others have made turning eighty look so darn desirable. Friends and family came out in force on November 30, 2016 to help the iconic Tennessean party late into the night at the biggest yet edition of his annual Volunteer Jam at the packed to the rafters Bridgestone Arena. 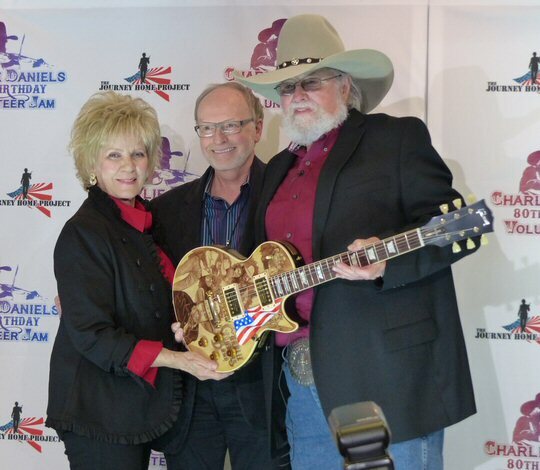 Charlie Daniels gets a custom Gibson guitar for his 80th birthday. Charlie is a beloved figure in country and rock music and he is cherished in Middle Tennessee for his kind, humble and giving spirit. If you didn't know it Charlie has spent the decades generously supporting many special causes especially involving the military. Recently, Middle Tennessee State University renamed one of their outreaches as the Charlie and Hazel Daniels Veterans and Military Family Center. Additionally, a portion of the proceeds from this night went to The Journey Home Project, a 501(c)(3) non-profit co-founded by Daniels and manager, David Corlew, to help Veterans of the United States Armed Forces. Prior to the main event Charlie hosted a press conference and a Q&A session backstage at the Bridgestone Arena. He shared the spotlight with many of his special guests who all received an engraved gun and knife to commemorate their participation in the Volunteer Jam. 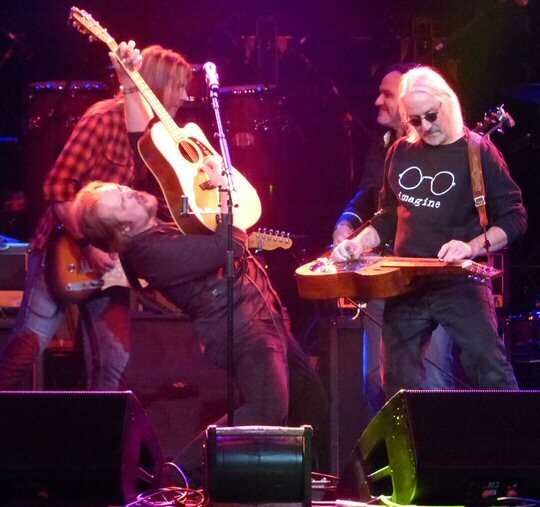 Daniels was also on the receiving end of the gift exchange as executives from Gibson presented him with his own custom-made guitar that contained his likeness on the front and a timeline that included highlights from his long and storied career. The honors continued for Daniels. Near the end of his set Charlie Daniels was surprised with the Rare Country Humanitarian of the Year Award presented to him by the country comeback kid Randy Travis with help from Lt. General Keith Huber. Charlie kept the momentum going by playing his mega-hit "The Devil Went Down to Georgia" - the song that helped secure his induction into the Country Music Hall of Fame across the street a little earlier in the year. Volunteer Jammers included Kid Rock, Luke Bryan, Chris Stapleton and Travis Tritt. 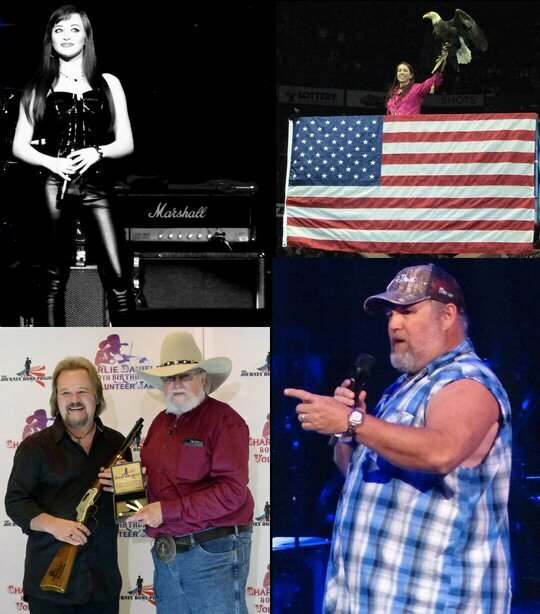 The Volunteer Jam is a multi genre musical extravaganza that stands now as one of Charlie Daniels' best known accomplishments. The legendary event began in 1974 at the War Memorial Auditorium in Nashville as a way of celebrating their first hometown sellout concert and to help facilitate the recording of the Fire On The Mountain live album. The annual show has since played all over Middle Tennessee at venues as diverse and historic as the Murphy Center in Murfreesboro, the Starwood Amphitheater in Antioch and the TPAC in the downtown. "This will be by far the biggest jam, people-wise, we have ever done," Daniels told reporters backstage before the concert. "We started out in the War Memorial with 2,200 seats back in 1974, 42 years ago. Tonight, we're somewhere between 14,500 and 15,000 people, so this will be, by far, the biggest jam we've ever done." Charlie capped off the night with an exciting set of music hosting a concert that he has produced and headlined for more than half of his life. Highlights included "Pledge of Allegiance / In America", "Long Haired Country Boy" and an acoustic and prayerful version of "How Great Thou Art" that revealed the birthday boy's deeply religious side. The show closed with special guests returning to the stage to run through the rock and country classics of "Can't You See" by The Marshall Tucker Band and "Will the Circle Be Unbroken?" popularized by the Nitty Gritty Dirt Band. More scenes from the 2016 Volunteer Jam in Nashville. Luke Bryan is still a relative newcomer on the scene who has pushed 16 singles to the No. 1 position on the charts. Unfortunately, on this night he'll be remembered for punching a fan in the face with his microphone. As Bryan confidently shuffled across the stage an attendee in the second row was giving the artist a double one-finger salute and a scuffle ensued that was caught on the giant big screens at the sides of the stage. Chris Stapleton is the artist who has taken Music City by storm the past few years. His laid back demeanor and strong songwriting skills have helped begin the long overdue burial of the bro country sound that dominated the country music airwaves for much of the new millennium. Stapleton cut his teeth on Broadway for well over a decade. He must have taken countless requests for "Freebird" and on this night he obliged by adding a few verses as an intro to his own devilish delight "The Devil Named Music". You would've expected the raucous rocker from Detroit better known as Kid Rock to be the disruptive one. Instead, the Tennessee transplant inspired with a new anthem he composed for the Volunteer State that he called "Tennessee Mountaintop". He then closed his time at the Jam with an extended version of the more rockin' "All Summer Long" that had the Bridgestone faithful up on their feet and enthusiastically singing along. 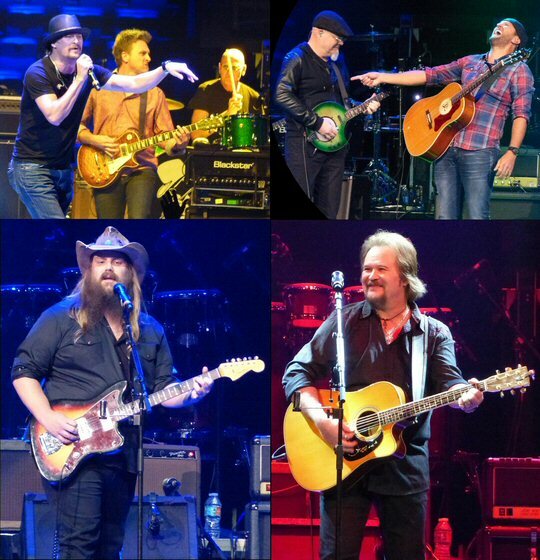 Travis Tritt lit up the stage at the sold-out Bridgestone Arena in Music City. Introduced as "one of the greatest singers of all-time" Travis Tritt proceeded to deliver the goods. A touching moment came when he invited his pretty daughter Tyler Reese Tritt who he called the reason for having shotguns in his house to share the stage to perform their cover of "Sometimes Love Just Ain't Enough". The Patty Smyth, Glen Burtnik composition was a hit for Smyth and Don Henley in the summer of 1992. Country boys Larry the Cable Guy and 3 Doors Down got the show off to a rockin' and funny start. Larry - the act who currently holds the #1 spot for event attendance at the Bridgestone definitely "got er done" with a bit that had the house in stitches. He remarked that "ain't nobody in Wal-Mart tonight" to much laughter. The rockers from Georgia finished off their segment with a super version of their powerful song "Superman" that really got a high-flying night of fun off to a great start. The Bridgestone Arena in the heart of downtown Nashville is home ice for the Predators. It also hosts a wide array of sporting and musical events such as the Volunteer Jam. Upcoming events at the venue include WWE Live Holiday Tour, Widespread Panic, Monster Jam, Harlem Globetrotters, Dierks Bentley, A Heroes & Friends Tribute to Randy Travis, AMSOIL Arenacross, Bon Jovi, Neil Diamond and Tom Petty & The Heartbreakers. 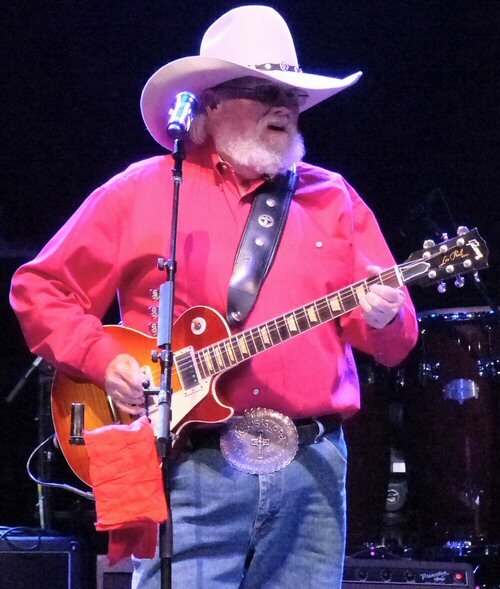 Mr. Charlie Daniels jams at his 80th birthday party in Nashville.